One of my crochet projects for Christmas is chapstick holders. This is a fast and easy project that is very useful. It takes a small amount of yarn. I used a size 3 mm hook and started with a magic loop. I then chain 2 and six single crochet into second chain from hook. Next I did a round of two single crochets into each single crochet for a total of 12 single crochets. 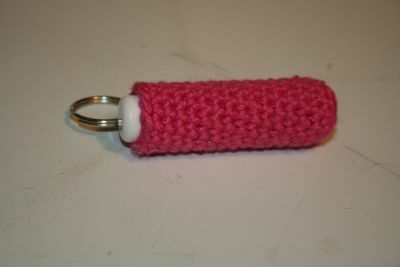 Then I did a few rounds of even crochet until the holder measured the size of the chapstick. I slip stitched into the next two single crochets. To make the loop for the keychain holder, I chained three and then slip stitched into the next two single crochets. I plan to make at least four of these – possibly more. I finished one last night, so I’m hoping to get more done this week. It will be nice to have something finished for Christmas finally. I searched for crochets and I found your blog. I really like it. Keep going – well done!